Wow! What a generous giveaway! I would love to bring a little spring to my house. I hope I win. It is just beautiful and such a generous giveaway. I was followeing on Google reader and now I am a public follower. I follow! And I love this quilt! I am now an official follower! Love following your posts and love this quilt! Love following your blog; love Pottery Barn; love the quilt!!! What a great quilt! I love your blog! I am madly in love with your home office, and you have inspired me to redo my bedroom at home! I love how your projects are so amazing, but I still feel as though I am capable of achieving a similar look. I blogged about your blog and giveaway on my blog, as well! Just added a blurb about your giveaway to my blog! I Follow! And this quilt is beautiful! I am following and love this! I'm following you now! That is one heck of a gorgeous quilt. love it. and now I follow! I follow! Would love this gorgeous quilt, I only have a blah black comforter. I need some spring! Following you. The quilt is wonderful. Thanks so much for offering the giveaway. Spring is on it's way! I would love to have that in my bedroom! And I am very happy to have found your blog! :) Very inspiring! Am now following...thanks to Pottery Barn for featuring you on Facebook! What a beautiful quilt!!! This is a gorgeous quilt! The colors match my bedroom perfectly, which reflects spring year round. This is a beautiful quilt - what a great giveaway! We are renovating our first floor in an historic Victorian in Bristol, RI and this would look fabulous on my antique bed! I can't wait to follow this blog - it looks like something I could get a lot of great info from! Best of luck to you! I just told a good friend of mine how much I wanted a Quilt and here you have one posted with all my colors!!! WOW and BEAUTIFUL!! why is there not a link on facebook??? I'm a follower, love that quilt! Beautiful quilt. It does make you think of Spring. I can't wait, I'm tired of the snow! I just joined as a follower!!! Love the quilt!!! Looks like Spring is in the air!! What a great blog, am now following, and I love the quilt! What a great giveaway! I saw this quilt in the Pottery Barn magazine. Love it! 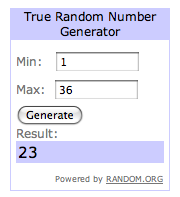 Thanks for adding my name to the giveaway! What a cool blog - I'm not a devote follower!! The quilt IS amazing!!!!! Oh my goodness, that is some goodness!!! What a beauty. I am a new follower!!! I will blog about it as well! Now a follower--love PB quilts! New to your blog/site but I love it already! I just joined to follow you! Great giveaway! I love that quilt! I'm a follower and I tweeted! Great quilt! Love the colors. Great site! Love your blog! Love the quilt! This would be a great addition to my sister that is doing her nursery in pottery barn items for her baby girl in June!!! Following your blog now! I'm just loving that quilt. This mom of 9 would love to be the proud owner of it! I am officially following you! always glad to find another beautiful blog to follow. I love this quilt and tweeted about this great giveaway! I'd love that quilt, it would look ultra-stunning in my bedroom!! I'm a new follower... and have just the place for this beautiful quilt! Great give away!! I'd love that quilt, it would look ultra-stunning in my bedroom!! I'm officially following you! I am so excited to have found your blog. Thanks to a link from PB on FB! This blog is right up my alley. I am always looking for ideas and you seem to have the same taste as me when it comes to decorating, etc. Yeah! I just signed up to follow you and have my fingers crossed that I win the quilt! We have plan to move my 5 year old son into our guest room which means we will need to re-do his room into a "grown up" room. This would be a perfect way to start! This is a beautiful quilt! My Mom and Dad lost most of their house in Hurricane Ike and slowly they have been replacing their lost items. This would be just the perfect quilt to put a SPRING back in Mom's step after months and months of hard work on their home. Thank you for the give away! I hope we win! You rock! Following you! What a beautiful quilt. Thanks for the opportunity! Very generous contest! Thanks for the opportunity to win this gorgeous quilt, I am in the process of redoing my bedroom and it would be absolutely perfect! Our masterbedroom needs a pick-me-up! The PB Quilt would be just what the decorator ordered!!! I love this quilt! I am obsessed with quilts and even make my own at times. This would lookgreat in my guest room :). I posted a link to your blog on mine, www.suziehome-maker.blogspot.com, for this giveaway. My fingers are crosses! Just found your blog and love it!!!! Yes, please enter me in the PB Quilt give away.I just FB'd yesterday that I hope Heaven uses Pottery Barn as it decorator. It's a beautiful quilt and I'd love to win it! I have a bare room that I simply cannot properly furnish right now. I wish I could have that quilt, then I could actually leave the door open and be proud whenever I walked by! I really am enjoying your blog. My husband and I just got a divorce, which has been very hard on me, and the only thing keeping my head up is thinking up new ways to decorate my house to really make it my own. Your blog is inspiring and you have done a great job with your space. 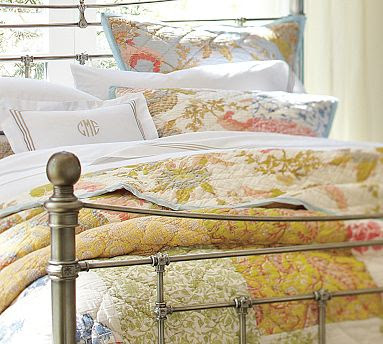 I love Pottery Barn and this quilt is gorgeous! Perfect addition to my daughters' room!!! Cool beans. Following and looking forward to seeing all the vintage changes. What a great giveaway! This quilt would bring some awesome brightness and color to any room. I would love to win this beautiful quilt for my neighbor. Her sister just passed away suddenly in Belgium. She was only 33. She is having a tough time coping and this would give her a little something to snuggle up with and enjoy the good memories she had with her. She's a beautiful woman inside and out and a busy mother of 3. She is truly a blessing as a friend. She brings light to your world just knowing her. A quilt of reflection & friendship! I'm a new follower! Excited about finding your blog and LOVE the quilt. The quilt is beautiful and would look great in my newly painted bedroom with my new bedroom furniture- my husband and I had been with the same suite we had used since we were married and thought we would give ourselves a present!! We bought a cherry sleigh bed and as I stated, the quilt would look divine on it!!!! I'm now following and would love to win this beautiful quilt! We just bought our first home, and this would look beautiful. I am a follower and I hope to win!! We need this quilt for our little log cabin home! we are an older couple on limited income, and wish to re-do our bedroom. this would fit our home and lifestyle perfectly! I just found you via Facebook and am now a follower. I am in the design industry myself so always interested in new design blogs. But I have to say the my most favorite part is your name;I have a 14 yr old daughter named Alaina! I have had my eye on this beautiful quilt! I look forward to following your blog! I've had my eye on this quilt since it first came out. It's so pretty, I would LOVE it. Great giveaway! I am now following your blog. I am now a follower. Excited about your giveaway...very nice! Have a great day. I love quilts! What a great giveaway idea! Looking forward to blog updates. Such a pretty quilt! I am redoing our spare room into my daughter's new bedroom and that would be perfect! So many things that I love about your blog. It's interesting, it's beautiful, it's full of good ideas and last but not least you have a wonderful giveaway going on and I would love that quilt to decorate a room in my shabby old house. i love that quilt! love love love! Beautiful quilt - new follower! ♥ I love PB...and I love the nastalagia that can be created by placing a quilt in a room. They add a sense of warmth and coziness no matter where they are placed. I would also place this quilt in a room with a glass chandelier hanging near by....wow!...that would be beautiful! ♥ Best wishes to all! Lots of great information on your site - will tell my friends to check it out. I'm a new follower and love your blog. Thank you for doing this giveaway! I love PB everything and have been longing for a PB quilt for sooooo long! How pretty! Neat blog... Following you now! I'm a new follower and a Facebook fan. What a gorgeous quilt and a lovely blog. Just came across your blog via Pottery barn.. I am loving the Quilt you are giving away--beautiful colors!! Ahhhh spirng is on its way--can't wait!! I'm a follower now! Love this quilt, it's beautiful, as are all things PB! Purdy quilt! I'd like to donn one on me bed! Beautiful quilt! It would really liven up my bedroom. Thanks for the opportunity to enter! I love your blog, I am now a follower. Love all things from Pottery Barn! Love this giveaway!- came across your blog via pottery barn on fb. Love it! What a nice blog. And a great giveaway! What perfect timing, I am redoing my bedroom and it would look so beautiful with what I've done. Thanks for the opportunity! what a beautiful quilt. following. Just found your blog through facebook and am going to love following. I am now a follower!! I am too a PB lover! I am a follower:) I love your posts, and that quilt is gorgeous! ok...just tweeted the giveaway...so excited! just logged into blog for first time in over 3 yrs to blog about this giveaway and will put on FB too! I want this quilt...btw...what size is it? New follower! I love your blog and that quilt!!! I'm a new follower. I'm so glad I now know about your blog. It's great! 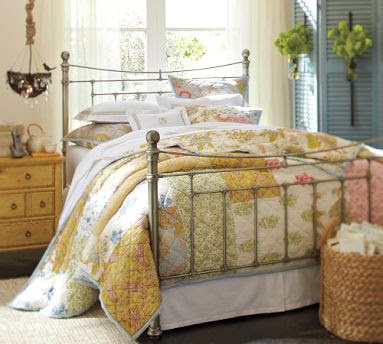 I've been lusting after the Colebrook quilt since the Pottery Barn farmhouse catalog. It's just beautiful. What a terrific contest! New follower :) What a beautiful quilt! OMG! So glad I found your blog...LUV it! luv the quilt, too! I would love to win this quilt for my guest room. It is so beautiful! I read your blog daily, but I am now an official follower. Thanks, Alaina. Feel better soon! Really pretty quilt. I hope I win! Follower! I love love love Pottery Barn!!! I can't wait to search your blog! Fivecheeks5@yahoo.com. Thanks so much!! I am now an offical follower!! !I Love,Love,Love this quilt!!! Love this quilt! Could see it on my new bed, which is interestingly, very similar to the one on your blog! Thanks! I am a follower and I SO hope that I win! I really need some new bedding! I've become a follower and I will tweet it and this quilt is so perfect for my bed. Thanks! Super giveaway! I just signed up to follow. I am a follower of your blog and love the quilt. Hope to find other good things as well on your blog. Thanks for the opportunity. I just found your blog. What an awesome lovely spot. I also love the quilt and thanks for the chance to win something so special. I am a follower of your blog. The quilt set would look fabulous in my bedroom! I am a new follower of your blog. P.S. What a fantastic giveaway opportunity....thank you so much for the chance! Great giveaway! And the quilt certainly makes you think of spring. I am a follower. Thanks! I am now a follower and love Pottery Barn! I am finally able to follow! It took a little work but well worth it... the quilt is absolutely beautiful.... I LOVE it! I signed up to follow LCY blog...love the quilt! I follow and love this! Beautiful!!! YAY! I am going to re-post up on my Facebook! I've always wanted a quilt! I'm following...I love the quilt, but I love the blog, too. Glad I found you!